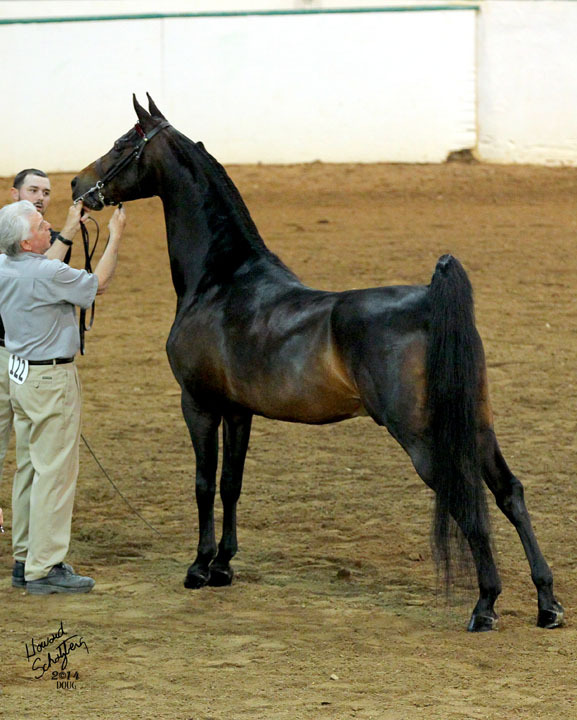 Building World Champion Morgan Horses from the ground up. 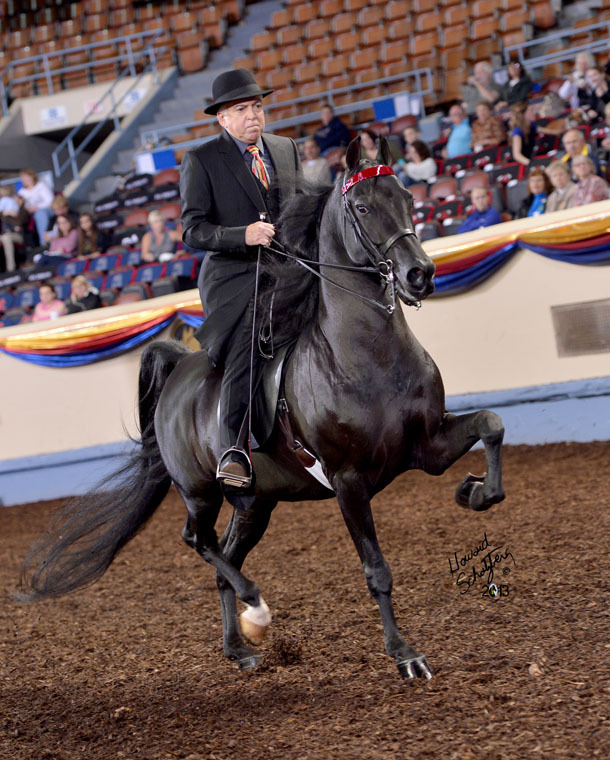 The 2014 Southern States Regional Morgan Horse Show is behind us now, but the southern hospitality and great rides and drives were a tremendous kick off to what we hope will be a fabulous show season. 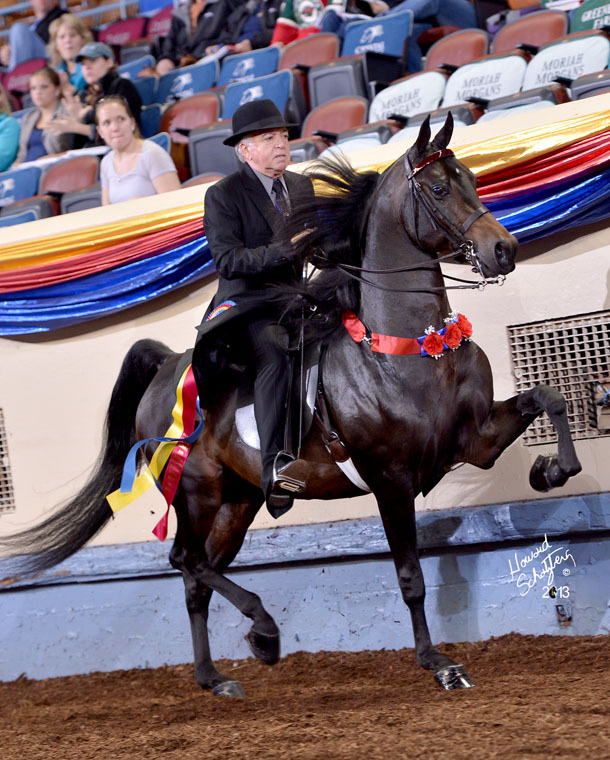 Starting the show off with a bang was the beautiful LPS Endless Love (Man In Motion x Illicit Love), owned by William Haines’ Ledyard Farm and presented by Lynn Peeples. After winning the Three Year Old Mares In Hand, this lovely young mare went on to be crowned Reserve Senior Champion Mare and finally Reserve Grand Champion Mare. 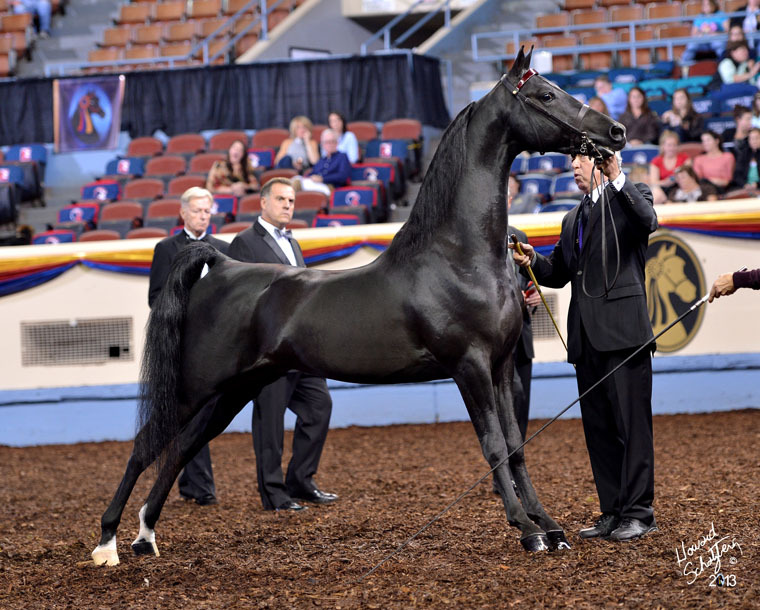 The boys were not to be outdone, as Ledyard’s Maximilian (Town Assets x Mendon Belle Amie), another Ledyard Farm entry, made his show ring debut memorable by bringing home the Junior Champion Stallion honors after securing a win in Two Year Old Colts. 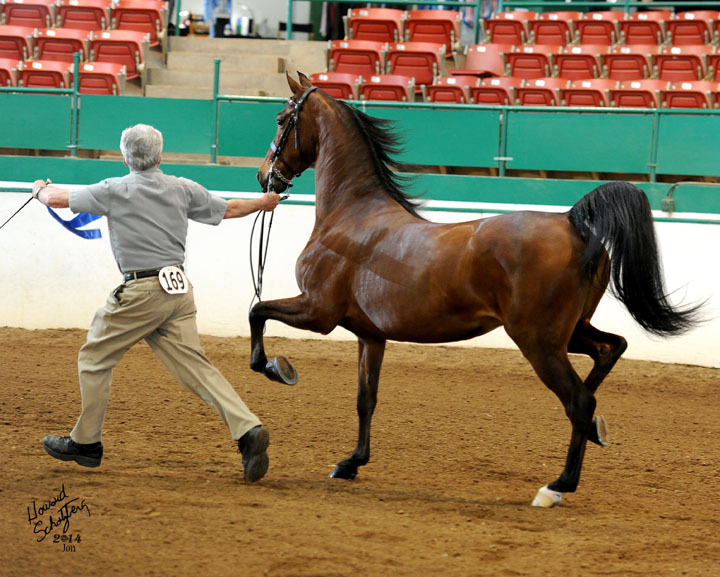 Full brother and stablemate Ledyard’s Eduardo topped the Three and Four Year Old Geldings in Hand on his way to Reserve Grand Champion Gelding honors. 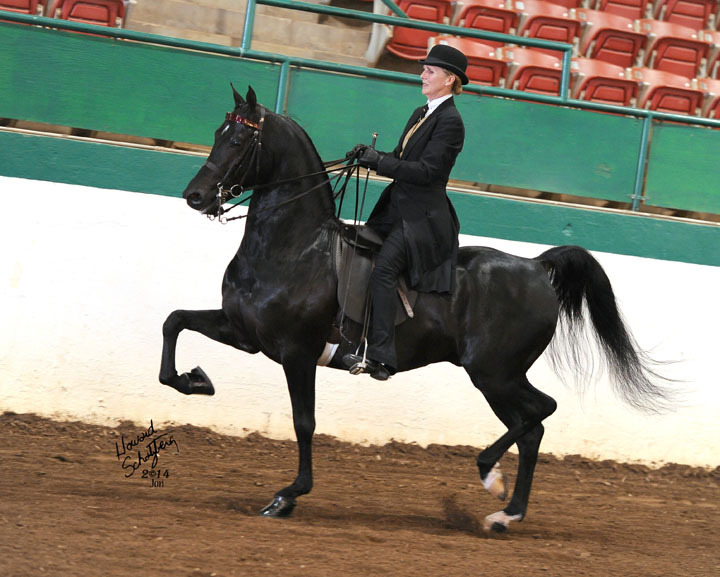 Jogging into the spotlight for Holly Seavitt was the beautiful black HL My My (HyLee The Rage x Hip Heath Teardrop), who won both the Ladies Western Pleasure and Western Pleasure Mares qualifiers on her way to a victory pass as the Ladies Western Pleasure Champion with Kathy Peeples in the saddle. 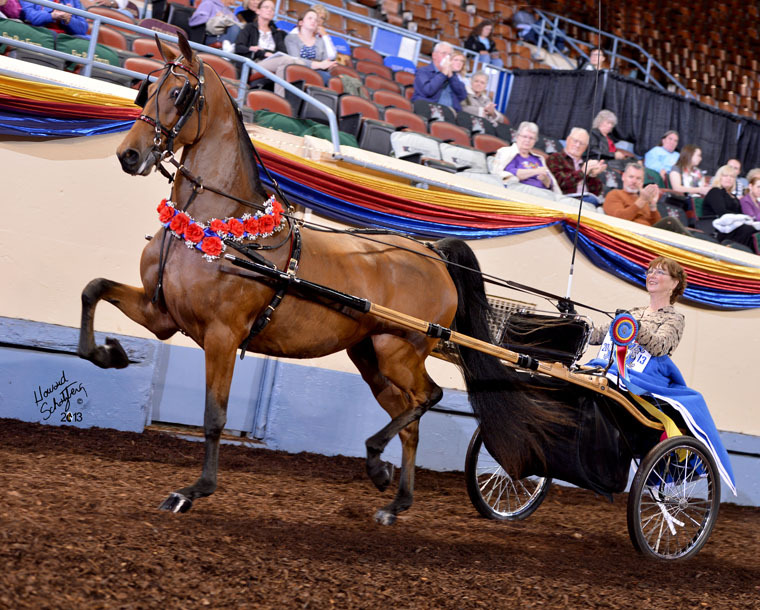 Last year’s People’s Choice Two Year Old Pleasure Driving Horse of the Year, this year’s Southern States UPHA Three Year Old Pleasure Driving Classic Champion! Portfolio (Town Assets x CHMH Grand Gift of Honey) continues to rack up wins for Ledyard Farms, this year with Lynn on the lines. This full sister to Tony Lee’s spectacular World Champion CHMH Spice Town Girl just gets better every year. Ledyard Farms and Bill Haines enjoyed watching another top young homebred in the spotlight as last year’s World Champion Junior Stallion, Ledyard’s Lucky Lucas (Astronomicallee x Graywoods Epona) made his saddle debut with Kathleen aboard to win the Three Year Old English Pleasure class. Our next stop is the Connecticut Morgan Show in Springfield, Massachusetts in June! Our 2014 foals are here! A bay colt foaled February 19th, by World Champion MIZRAHI and out of Town Sweetheart, a full sister to WC Man In Motion. A bay colt foaled March 1st, by World Champion sire TOWN ASSETS and out of MEM Uptown Girl (Man About Town LPS x Kim’s Bellegante. A bay colt foaled March 26th, by ROBERTO CAVALLI and out of WC producer Honeytree’s Simply Unique. A bay filly foaled April 26th, by WC MAN IN BLACK and out of HVK Classic Design, a full sister to the legendary HVK Bell Flaire. If you’re shopping for a top prospect, better call soon or these little darlings will belong to someone else! Posted in News | Comments Off on Our 2014 foals are here! Big congratulations to our very own Samantha Eppell for a great showing at the Children’s Benefit show this past weekend! 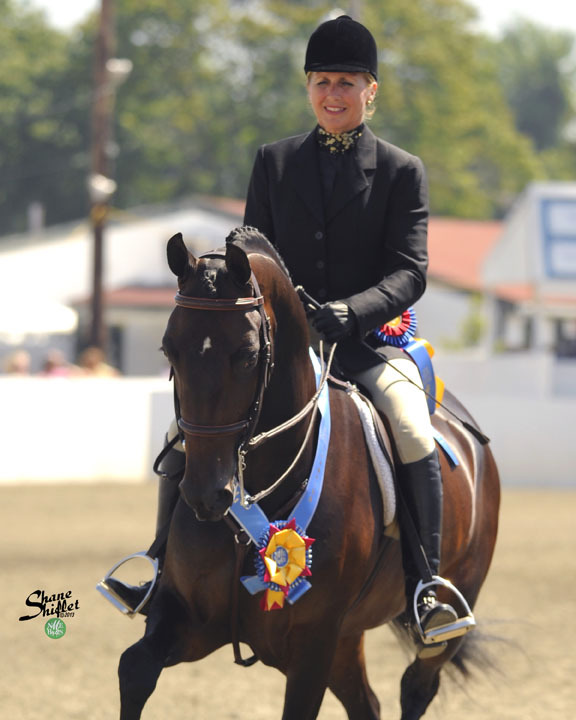 She won her hunt seat equitation qualifying class, her championship, and the junior exhibitor hunter pleasure class aboard Cynthia Brown Clark’s beloved RGR Moonshadow. 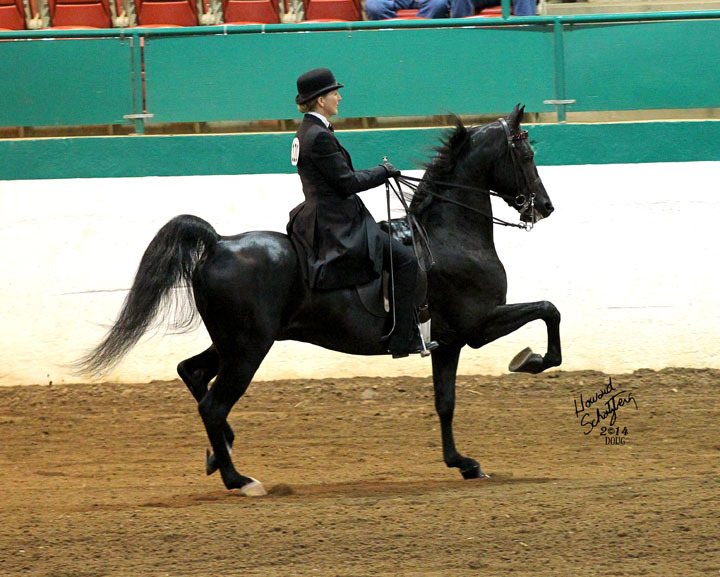 Thank you to Deanna Folckemer for coaching her to these great showings this past weekend! 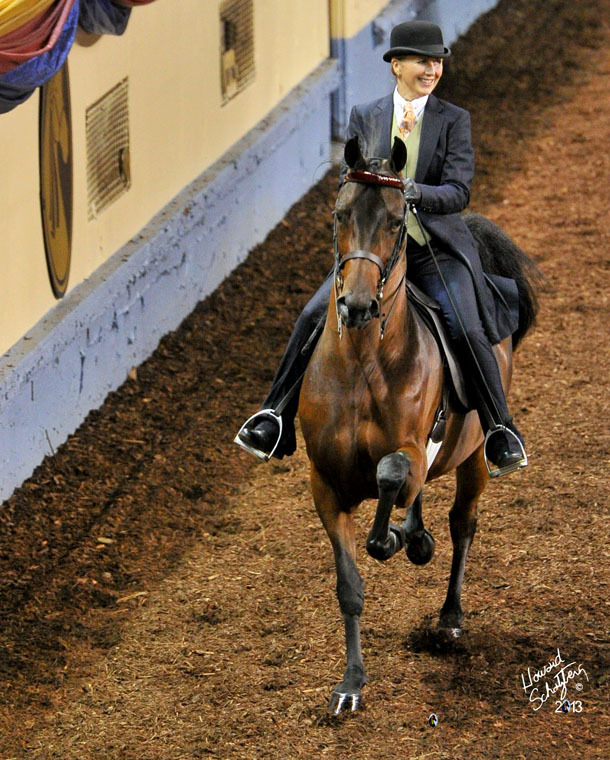 Each year, we are flattered by the votes given our horses by their fans in the stands. 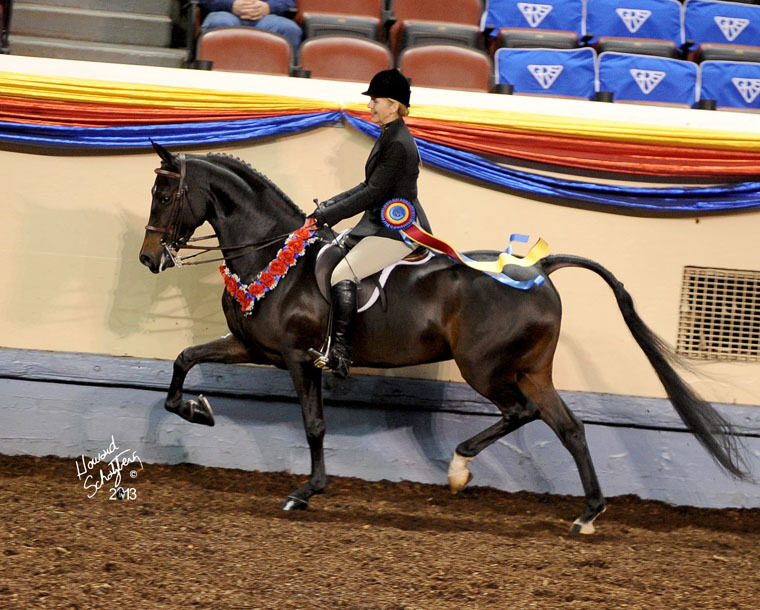 This year, we had a spectacular line up that received People’s Choice Awards from Saddle Horse Report. Congratulations to everyone! 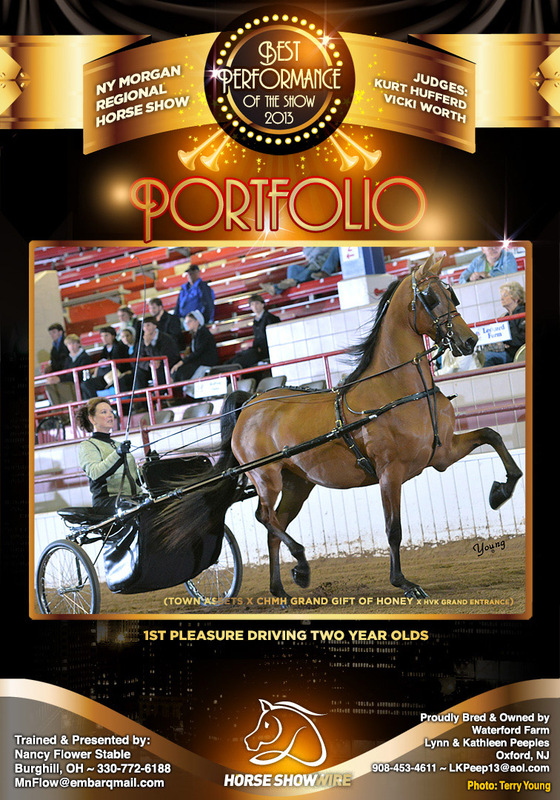 PORTFOLIO (Town Assets x CHMH Grand Gift of Honey) Overall Two Year Old Pleasure Driving Horse of the Year, Two Year Old Pleasure Driving Mare of the Year (Nancy Flowers, trainer), owned by Lynn Peeples LLC. 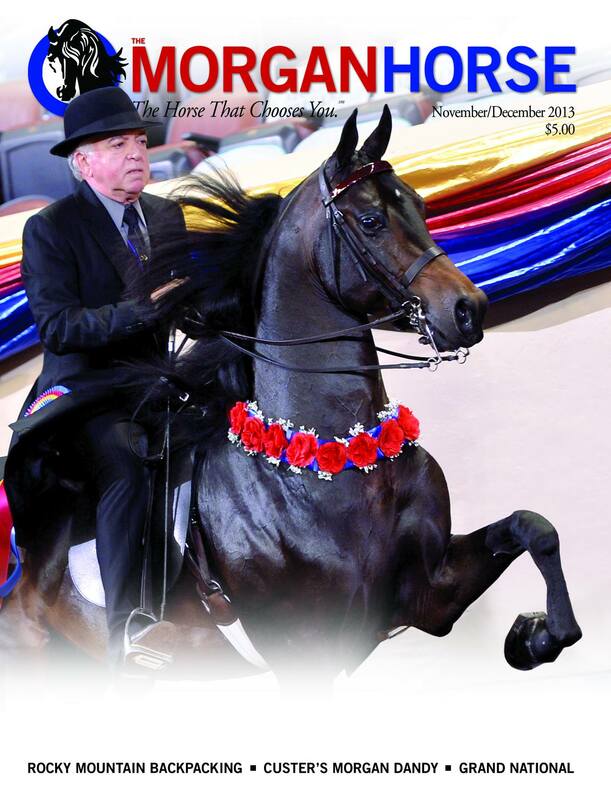 Arriving on doorsteps in late November is our breed journal, The Morgan Horse magazine, complete with World Champion Ledyard’s Eduardo (Town Assets x Mendon Belle Amie) gracing the cover. 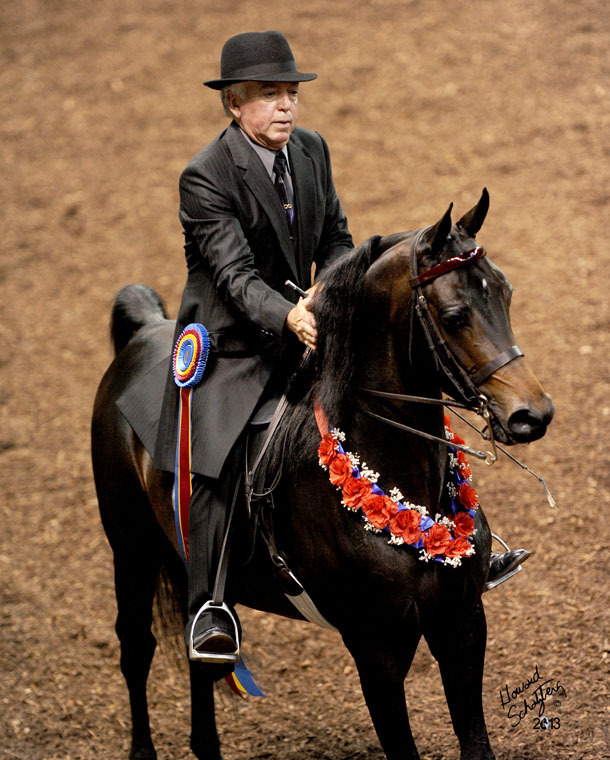 This exciting young stallion was the 2013 Three Year Old Futurity Park Saddle World Champion for his owner/breeder Bill Haines. This cover was sponsored by Ledyard Farms and the great moment was captured by ace photographer Howard Schatzberg. Congratulations to the Okopny Family! We are happy to congratulate the Okopny Family on their purchase of the wonderful gelding WITHOUT LIMITS (Astronomicallee x Salem Christine). Simon will be under the direction of Mary Carlton at Crystal Farms in Marshall, Michigan. Mary will be pairing Allie Okopny and Simon and we are excited to be able to cheer on this great new team. Posted in News | Comments Off on Congratulations to the Okopny Family! 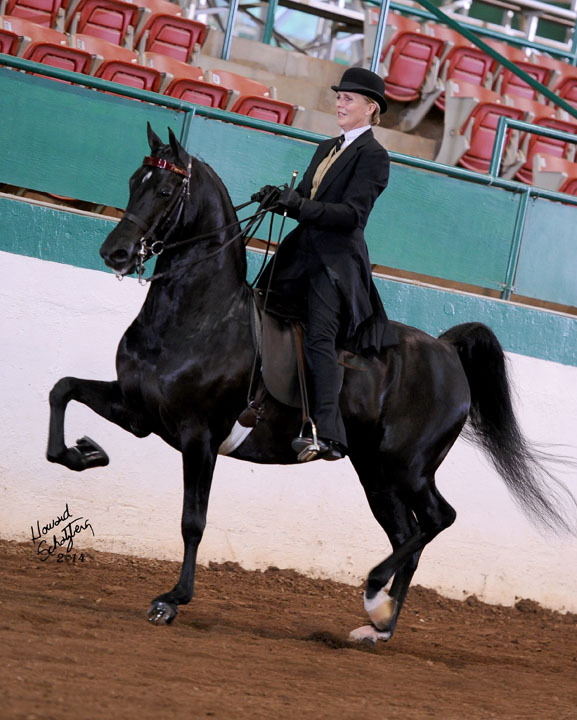 The Grand National & World Championship Morgan Horse Show is always the cherry on top of the sundae for Waterford Farm clients and horses at the culmination of each show season. 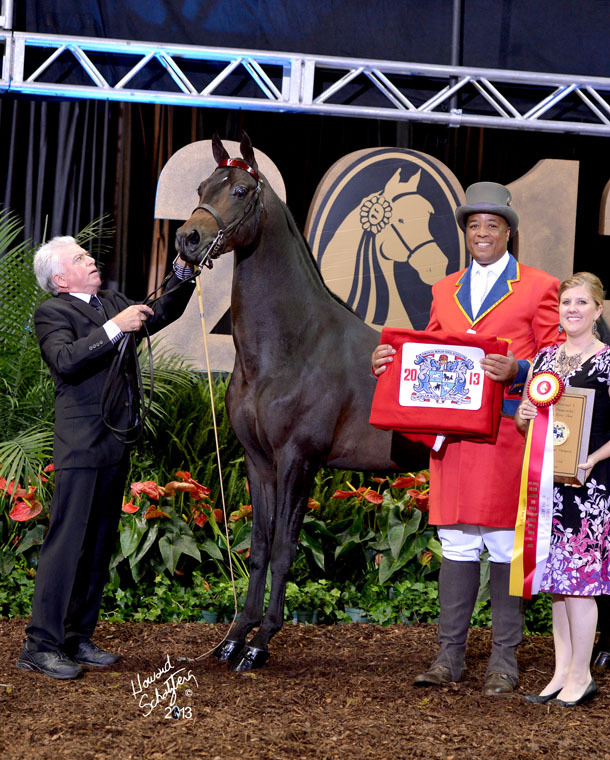 The 2013 edition did not disappoint in any way, and many new World and Grand National Champions were crowned. 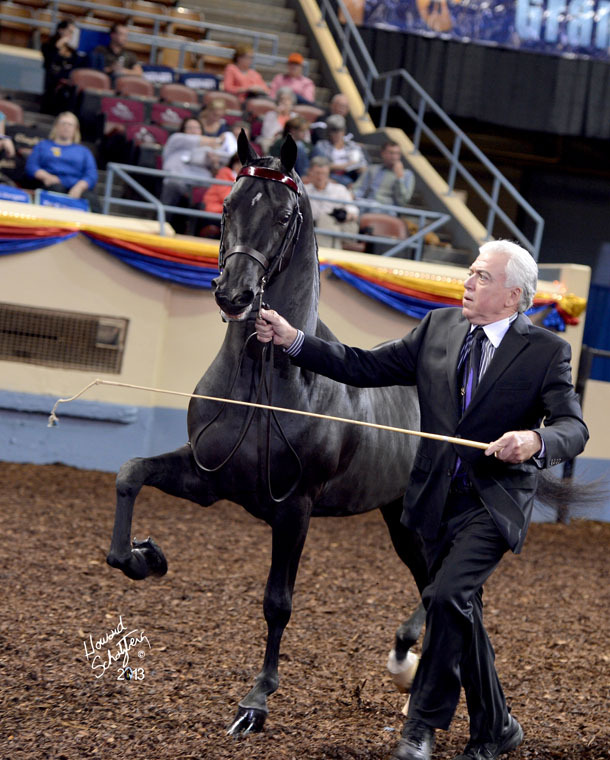 The Ledyard Farm horses did William Haines proud as they won in both performance and in hand during this competitive week in Oklahoma City. 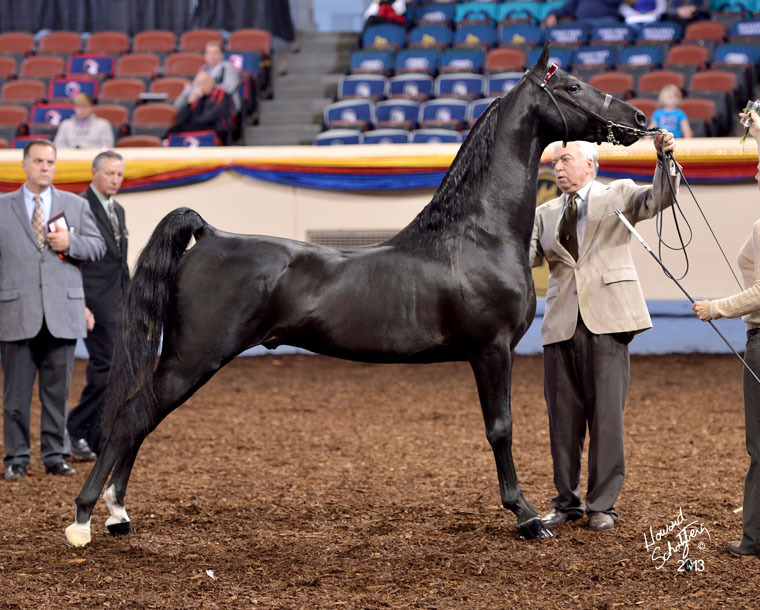 Ledyard’s Lucky Lucas (Astronomicallee x Graywoods Epona) marched to the head of almost all of his classes with the titles of Reserve World Champion Stallion, World Champion Junior Stallion, Grand National Champion Two Yr Old Stallion, World Champion Futurity In Hand Two Yr Old Stallion, and finally Grand National Champion Pleasure Driving Two Year Old Stallion & Gelding. 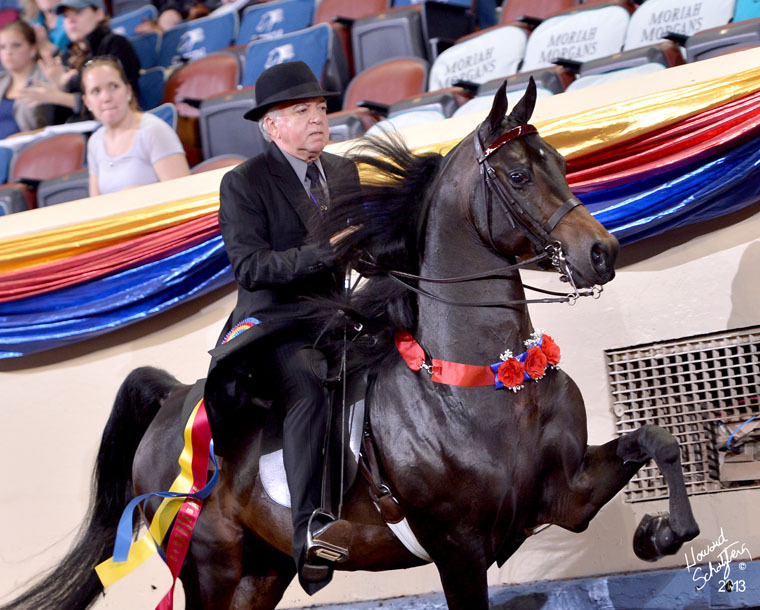 Stablemate Ledyard’s Eduardo (Town Assets x Mendon Belle Amie) started his week as the Three Year Old Stallion Reserve Grand National Champion, and ended it as the Futurity Three Year Old Park Saddle World Champion. 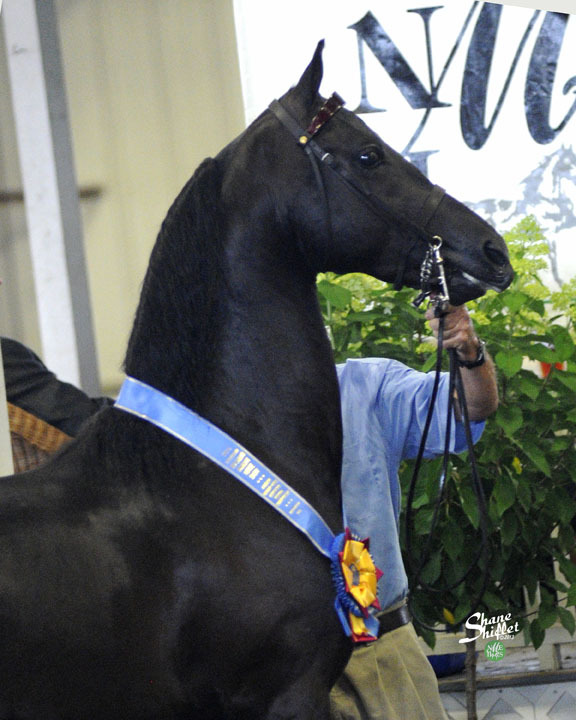 Man In Black (Town Assets x Town Sweetheart) and Lynn were on fire to win the Grand National English Pleasure Stallion Championship for Bill Haines. 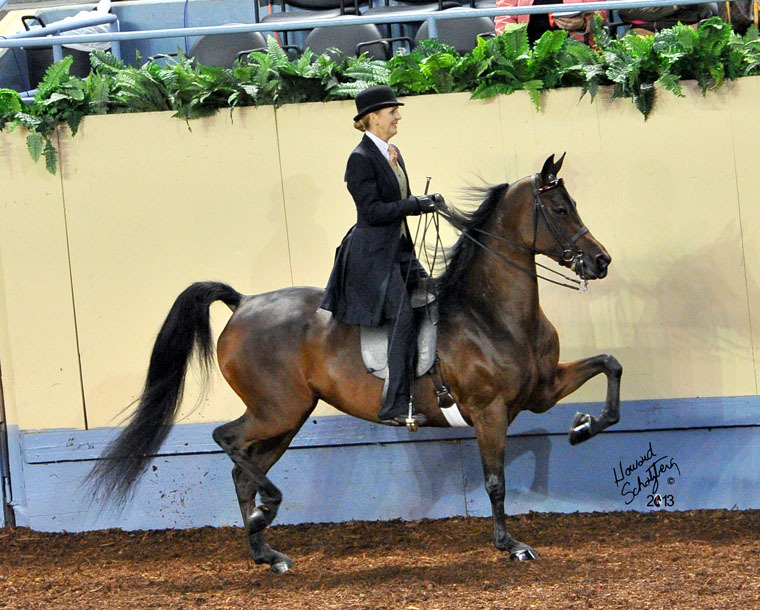 Colleeen Baptist’s beautiful Ledyard’s Donatella (Mizrahi x Boot Scootin’ Boogie) was named Grand National Champion Three Yr Old English Pleasure Mare, and came out of the Three Year Old English Pleasure World Championship with a Top Three ribbon, an excellent showing for this nice young mare. 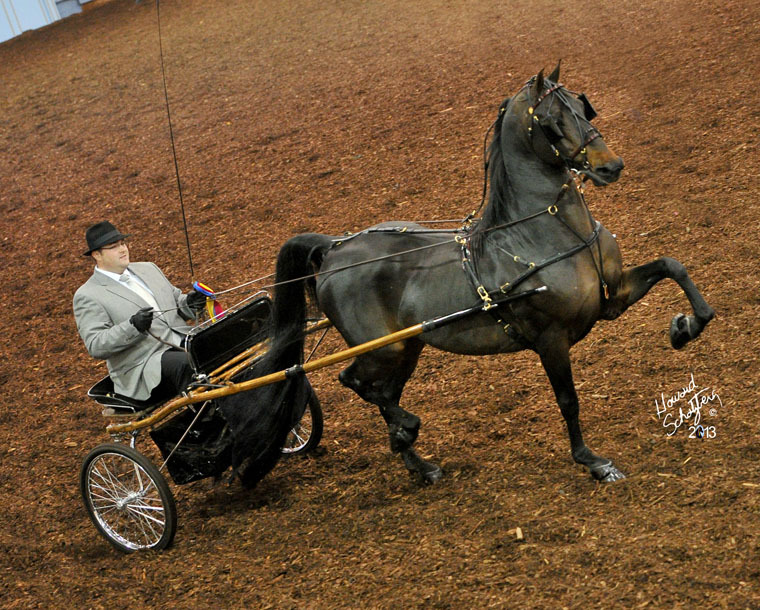 Steven Handy and Bellerophon (HVK Bell Flaire x Carmen Sandiego) had just one warm up showing at the NY Regional after a three year hiatus from the ring, but drove into OKC with winning on their list and took home the Grand National Pleasure Driving Amateur Gentlemens Finals Championship for their efforts. 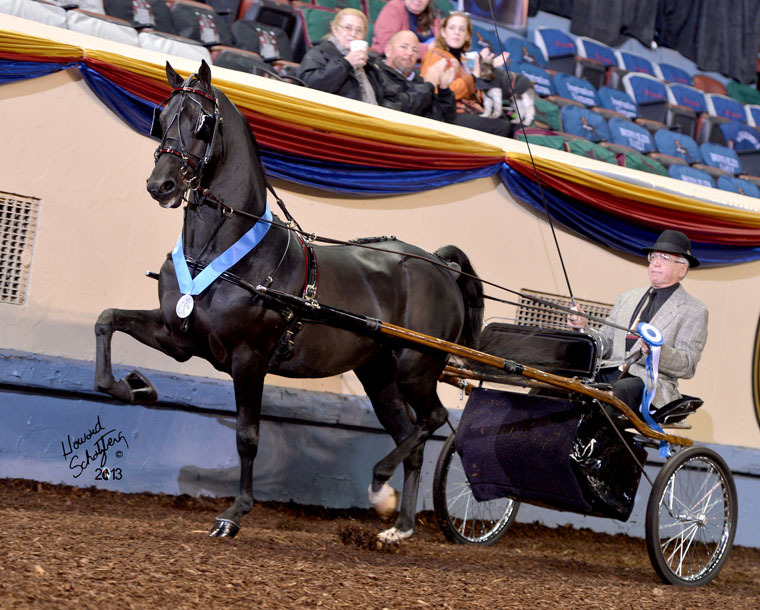 Steven and Beau were also Pleasure Driving Amateur Stallion/Gelding Reserve Grand National Champions and enjoyed a great showing to third in a tough class of World Champion Pleasure Driving Amateurs. 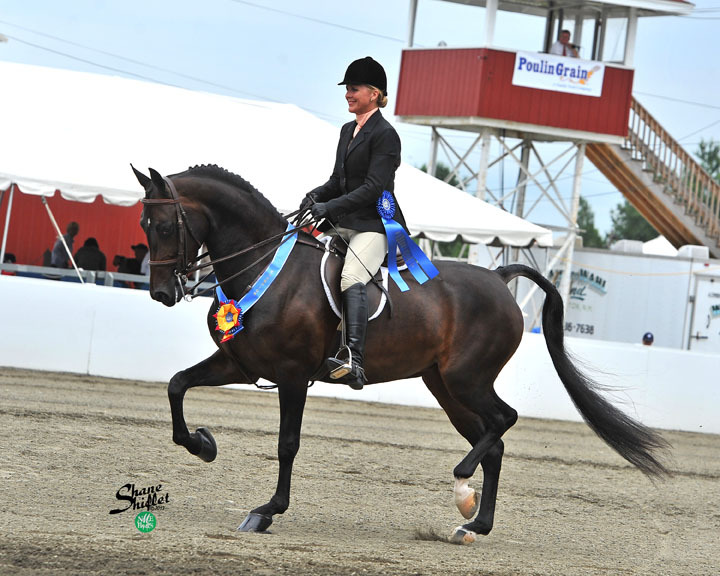 After a great season winning UPHA Classics at both the Gold Cup and New England Regional, Doug & Marlene Sluiter’s elegant mare Patrick’s Girl (Town Assets x Gossip Girl) turned in three stellar performances in Oklahoma to bring home World Championships in both the Open and Futurity Three Year Old Hunter Pleasure division. On her way to the top, she also won the Grand National Hunter Pleasure Three Yr Old Mare Championship. Our buttons are busting over the judges’ choice for BEST PERFORMANCE of the New York Morgan Regional Show. Our home bred PORTFOLIO (Town Assets x CHMH Grand Gift of Honey), just a two year old and a full sister to Tony Lee’s multiple World Champion CHMH Spice Town Girl, captured their attention and held it throughout the show. Very special thanks to Nancy Flower for doing such a wonderful job training this young star, we can’t wait for Oklahoma! And of course, a big thank you to the judges–Kurt Hufferd and Vicki Worth! 2013 NY Regional Champions Reign at Waterford! 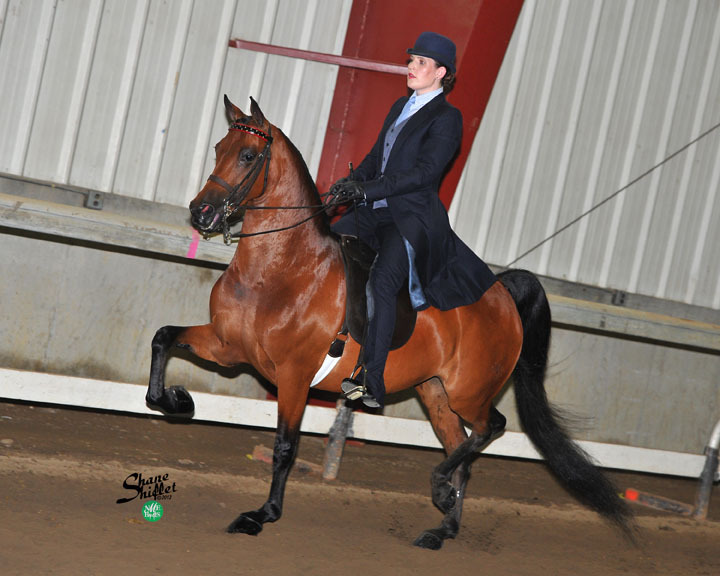 With a full schedule from start to finish, it was a herculean task for the Waterford staff, but they came through with flying colors at the 2013 New York Regional Morgan Horse Show in Syracuse, NY in September. 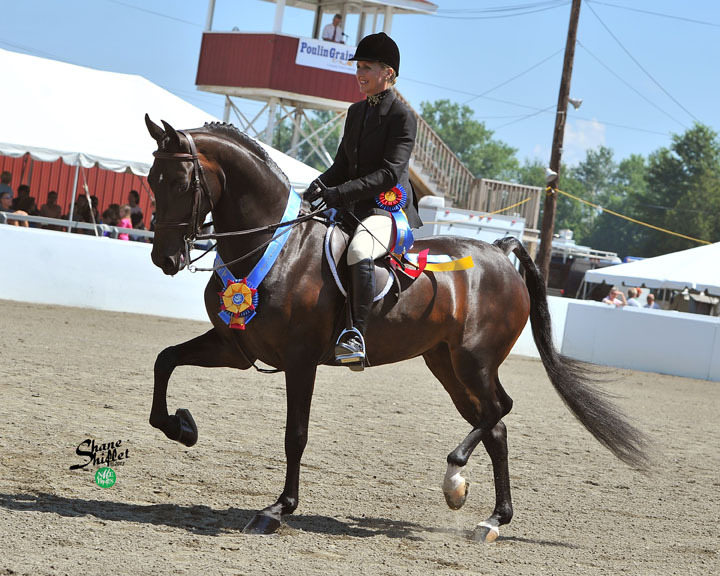 With great young horses in the NYSMHB Futurity making their show ring debuts, to the seasoned campaigners putting their final touches on performances in preparation for the Grand National next month, the Waterford horses shined in every division. 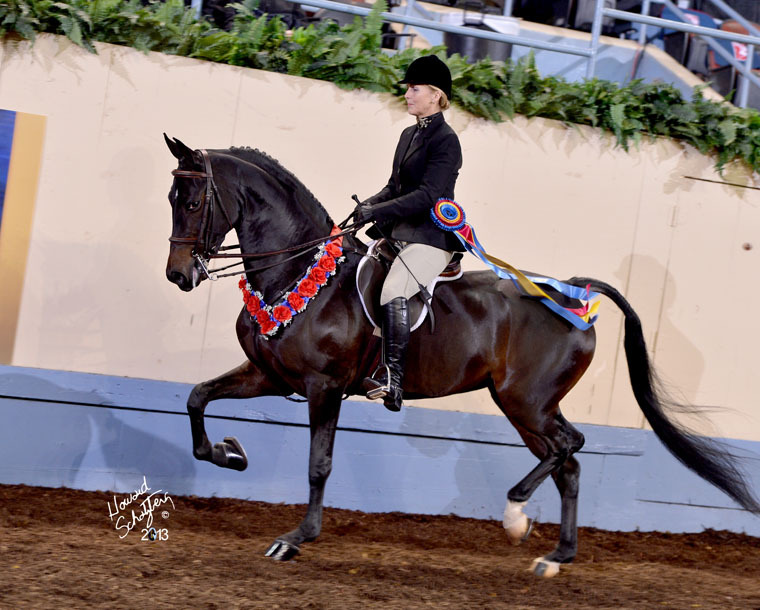 William Haines’ Ledyard Farm continues to breed wonderful Morgans for the future, and Ledyard’s Eduardo (Town Assets x Mendon Belle Amie) was at the head of the class as the Junior Park Saddle Champion and the winner of the Junior Park Saddle qualifier. Stablemate Ledyard’s Lucky Lucas (Astronomicallee x Graywoods Epona) secured the Two Yr Old Pleasure Driving Championship as well as the NY Morgan Futurity Two Year Old Pleasure Driving Championship. 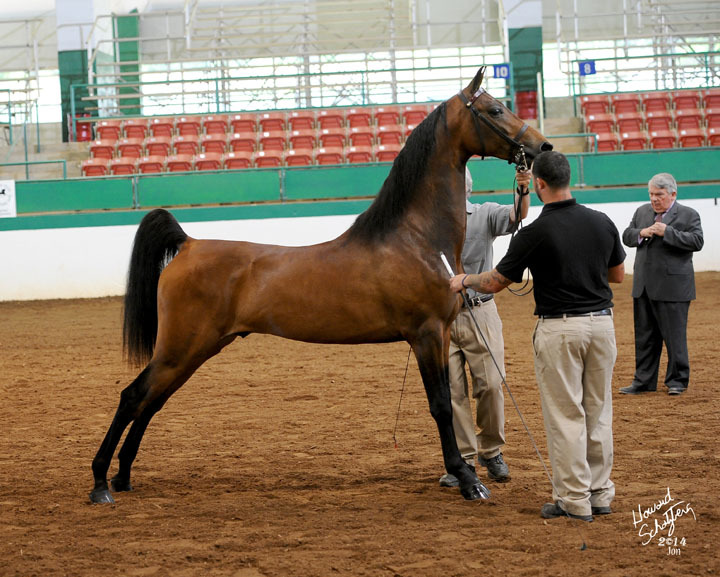 Proving form to function, he was also the Reserve Grand Champion Stallion after being named Reserve Junior Champion Stallion and winner of the Two Year Old Stallions In Hand qualifier. From the distaff side, Ledyard’s Donatella (Mizrahi x Boot Scootin’ Boogie), a recent acquisition of our Canadian neighbor Colleen Baptist, was the NY Morgan Futurity Three Year Old Champion overall after winning the NY Morgan Futurity Three Yr Old Mares qualifier, as well as taking home the blue in the Three Yr Old English Pleasure qualifier. Colleen was also ecstatic as she watched her home bred Mirabel’s Sir Galahad (Town Assets x JW Glowing Girl) top a competitive class of weanlings to bring home the bacon in the NYSMHS SSA Weanling Sweepstakes. Lynn lead this fabulous colt and looks forward to more great appearances as he grows up. It was great to have Steven Handy and Bellerophon (HVK Bell Flaire x Carmen Sandiego) back in the ring after a three year hiatus, and this savvy team hadn’t forgotten a thing as they drove to the top of the Amateur Pleasure Driving Championship and qualifier in fine style. 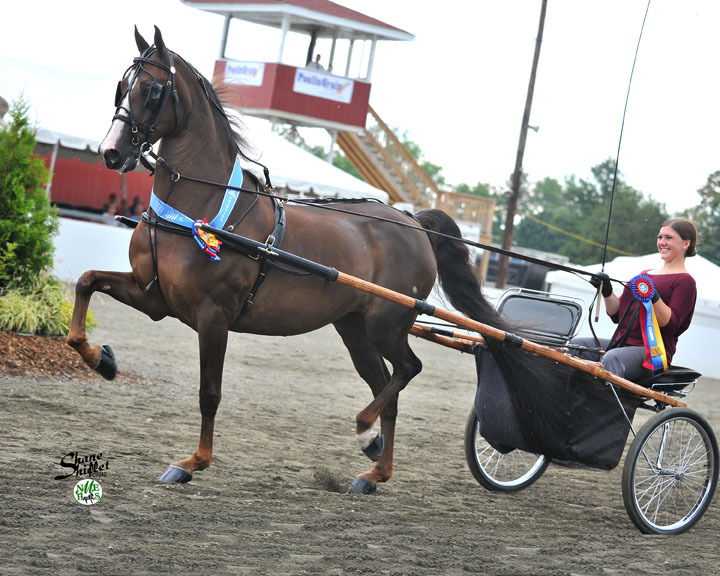 LPS home bred Moe Tall (Man In Motion x Illustra Aurora) continued his undefeated season by winning the Junior Horse Park Harness Championship here as well as the Junior Park Harness qualifier for owner Erdenheim Farm LLC. Harlan’s Azurean (Mizrahi x NAS Esperanza) just keeps getting better and better for owner John Yutzy. The NY Regional wrapped up his first show season ever and he ended it in style as the Open Park Saddle Championship here, as well as winner of the Park Saddle Limit Horse. This exciting performer is available for purchase! LPS Endless Love (Man In Motion x Illicit Love), a talented two year old mare co-owned by Lynn Peeples LLC and Ledyard Co LLC, continued her undefeated season by winning Grand Champion Mare, Junior Champion Mare and 1st Two Year Old Mares at this show, priming her for a finale at the Grand National next month. Deborah & Alex Cojocar continue to stock their NJ farm with quality individuals, and AMHF Illusion of Grandeur (HVK Bell Flaire x Delusions of Grandeur) is the newest jewel in their crown. 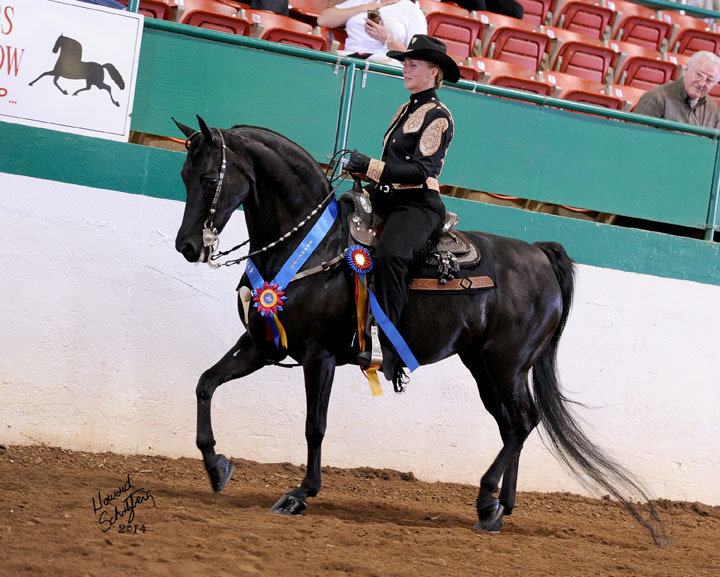 This elegant young mare took their daughter Lauren Cojocar to the top of the Amateur Park Saddle Championship after a solid win in the qualifier. 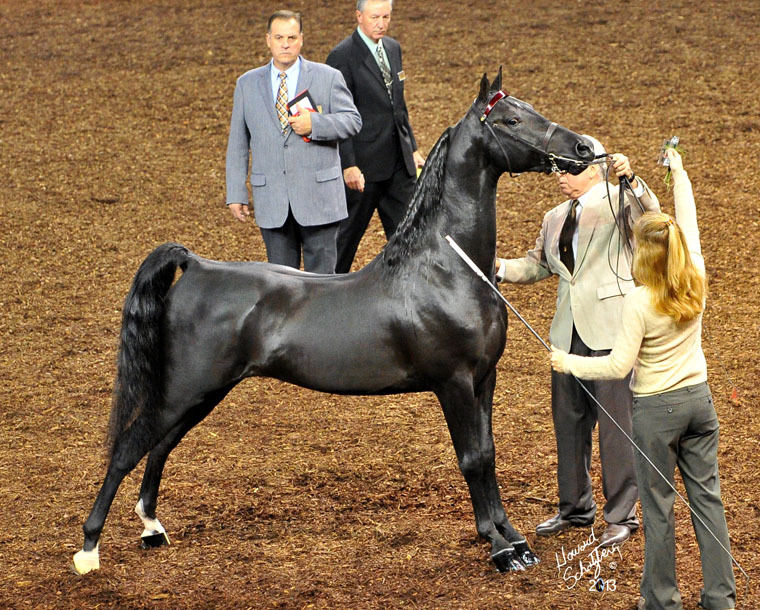 Their up and coming young stallion ADC Man On Fire (Man In Motion x Alphastar Exotic Assets) made a winning debut at this show in 2012 as a weanling, and trotted into the ring in 2013 to claim the titles of Grand Champion and Junior Champion Stallion after winning the Yearling Colt qualifier. He then returned to the ring to win the NY Morgan Futurity Yearling Championship and the NY Morgan Futurity Yearling Colt class. His name certainly says it all! 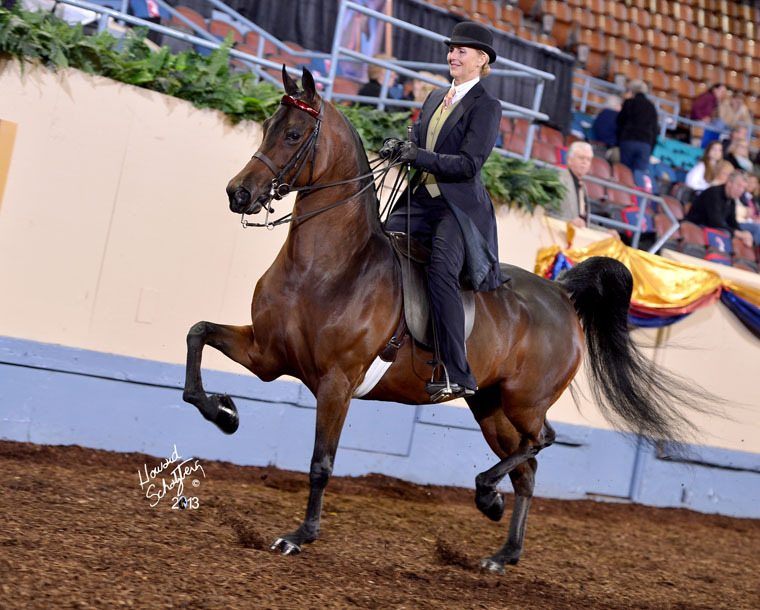 Cindy Fawcett’s LPS Beaudacious (Bellerophon x Illicit Love) has been busy this year getting acclimated to the show ring and had an incredible NY Regional with Cindy in the saddle. 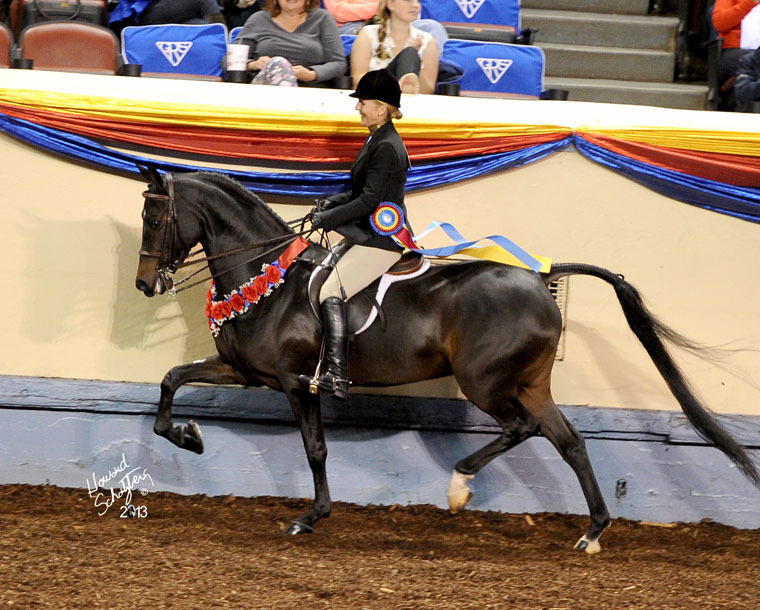 This fresh new pair made their debut together as the Classic Pleasure Saddle Junior Horse Champions after a blue ribbon performance in Classic Pleasure Saddle Junior Horse. Holly Seavitt’s solid performer HL My My (HyLee The Rage x Hip Heath Teardrop) turned in a beautiful performance to be named Reserve Champion Ladies Western Pleasure with Kathleen Peeples up. Dragonsmeade Oberon (And The Beat Goes On x Dragonsmeade Valkyrie) sped away with both the Roadster to Bike qualifier and the Championship for owner Paul Calandra, with Lynn Peeples on the lines. 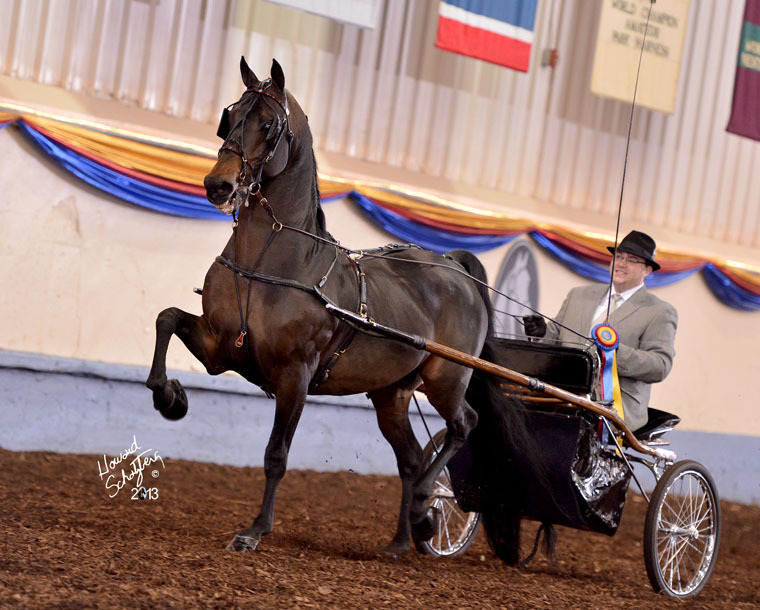 Lynn also presented Sam Lapp’s SSL Ultimate Design (Bellerophon x Honeytree No Illusion) to a clean sweep at this show, as this pair went through the In Hand division to secure Grand Champion Gelding and then won the Three Yr Old Pleasure Driving class. 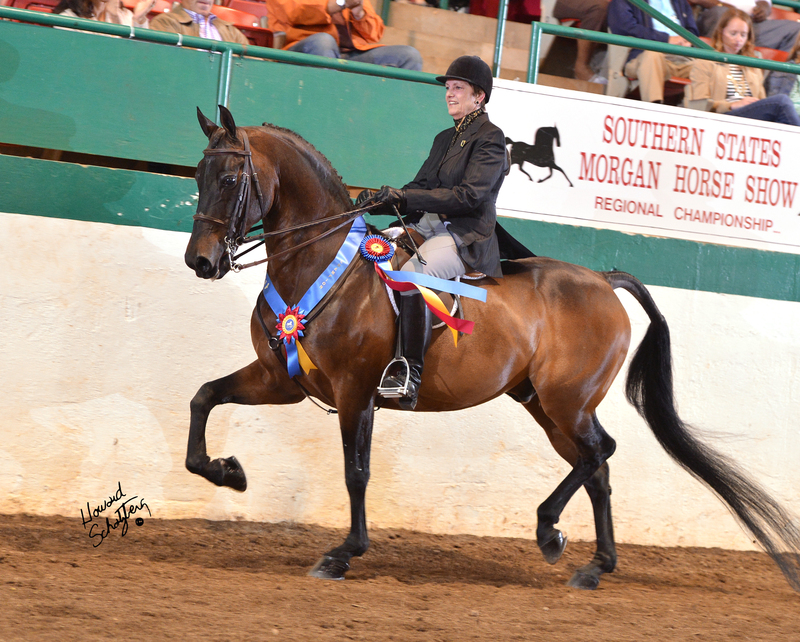 Eli and Rebecca Lapp know how to breed a winner, and their EKL May Acclaim (Town Assets x Illustra Aurora) proved it once again making a victory pass in the English Pleasure Stallions & Geldings on their way to the English Pleasure Open Reserve Championship. 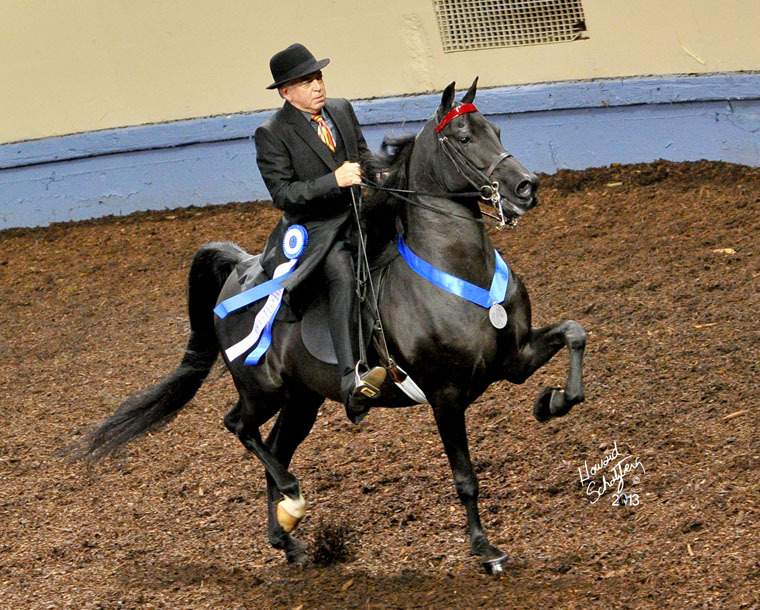 The New York State Morgan Horse Society’s Stallion Service Auction funds several lucrative classes for breeders, and Robert Westrick was the recipient of a hefty check for winning the Park/English Pleasure/Classic Sweepstakes as Lynn rode SSL Reba’s So Emotional (Man In Motion x Honeytree No Illusion) to the top of this competitive class. Robin Herrick’s Cherrydale Ariella (Minion Millennium x Cherrydale Gabriella) is a full sister to the many time World Champion Cherrydale Casseopia, and is heading in the same direction as her famous sibling. After a clean sweep at the Penn-Ohio Show, this nice three year old mare came back from Syracuse with Reserve Grand Champion Mare, Senior Champion Mare and a win in the Three Year Old Mares class. We are excited to see her after a winter of maturation and expect her to be one to watch in the future. 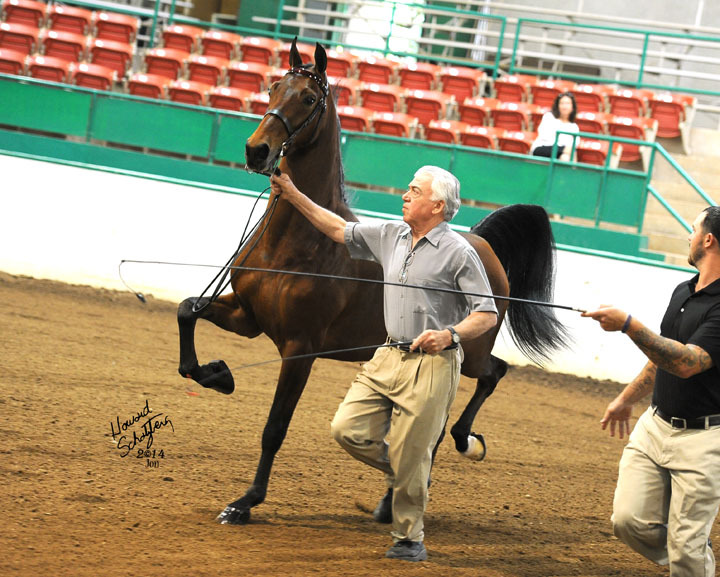 Although not in the Waterford stable aisle, Lynn and Kathleen were also thrilled with the performance of their young star, Portfolio (Town Assets x CHMH Grand Gift of Honey), a full sister to Tony Lee’s World Champion CHMH Spice Town Girl, who made just one appearance at NY with trainer Nancy Flower as the winner of the Two Year Old Pleasure Driving qualifier and simultaneously won the attention of the two judges, Kurt Hufferd and Vicki Worth, who voted her HorseShowWire’s Best Performance of the Show. Posted in News | Comments Off on 2013 NY Regional Champions Reign at Waterford! 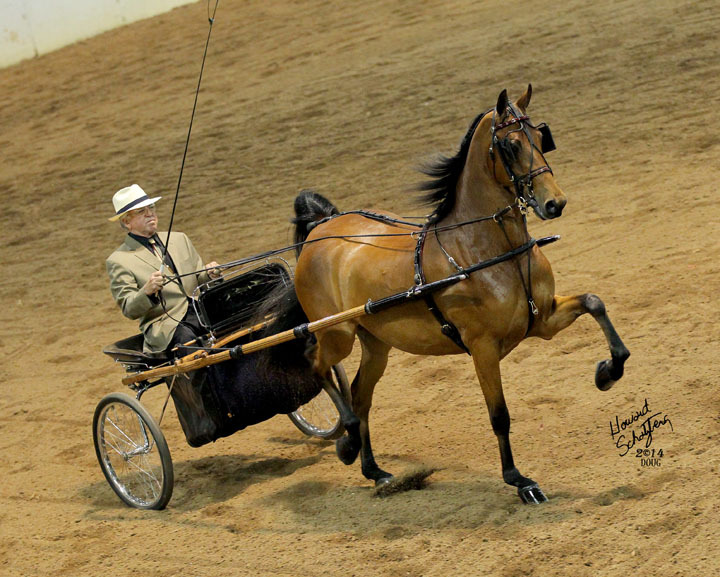 Class after class, the Waterford horses and riders/drivers proved that they had done their homework and were up for the challenge of one of the biggest Morgan Horse shows in the country. We couldn’t be more proud of their results and we’re looking forward to taking many of these great teams on to the Grand National in October. Patrick’s Girl and Kathleen repeated their victory from Gold Cup by winning the UPHA Hunter Pleasure Classic here at NEMHS, then finished their week with a tricolor from the Hunter Pleasure 3 Yr Old division for Doug & Marlene Sluiter. 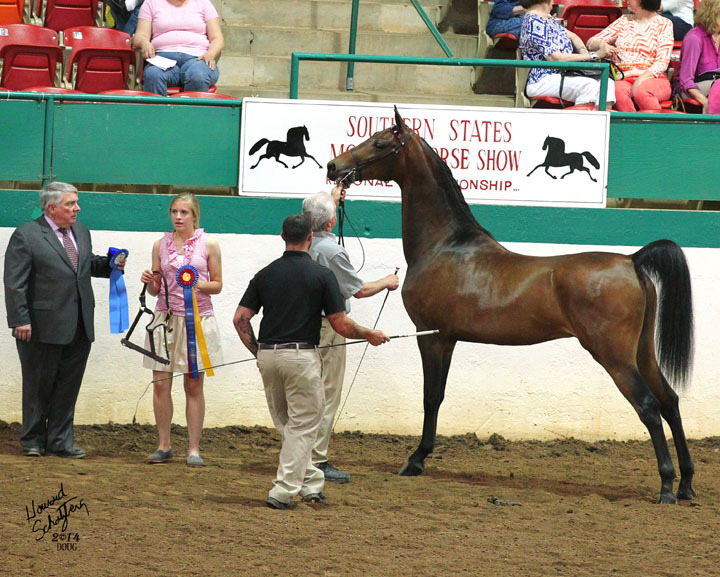 Ledyards Lucky Lucas (Astronomicallee x Graywoods Epona) made his 2013 debut at NEMHS with Lynn on the lead and came away with Reserve Grand Champion Stallion, Junior Champion Stallion and the blue ribbon in Two Year Old Colts for breeder/owner William Haines of Ledyard Farm. 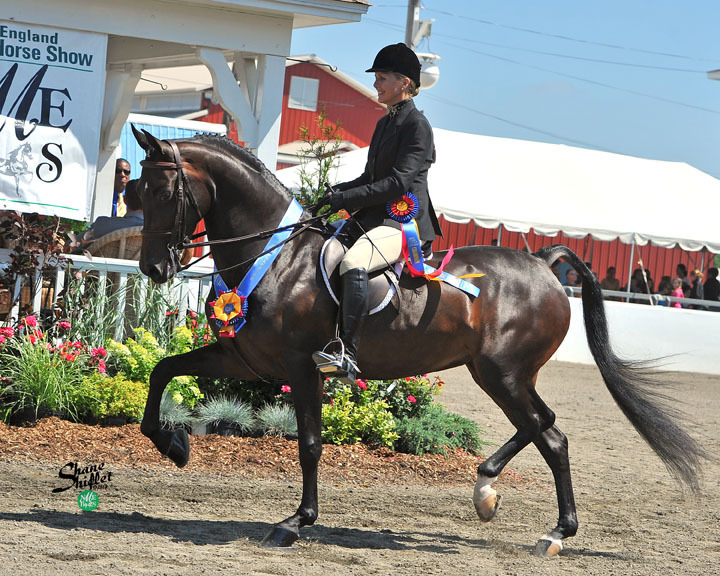 Gradell Angel of Peace and Ashley Young won the Classic Pleasure Saddle Mares class for Drs. Shirley & Jerome Modell. This lovely mare is available for purchase, please visit our Sales Page for more information. LPS Endless Love was the Junior Champion Mare and winner of the Two Year Old Fillies In Hand with Lynn, her breeder and owner. 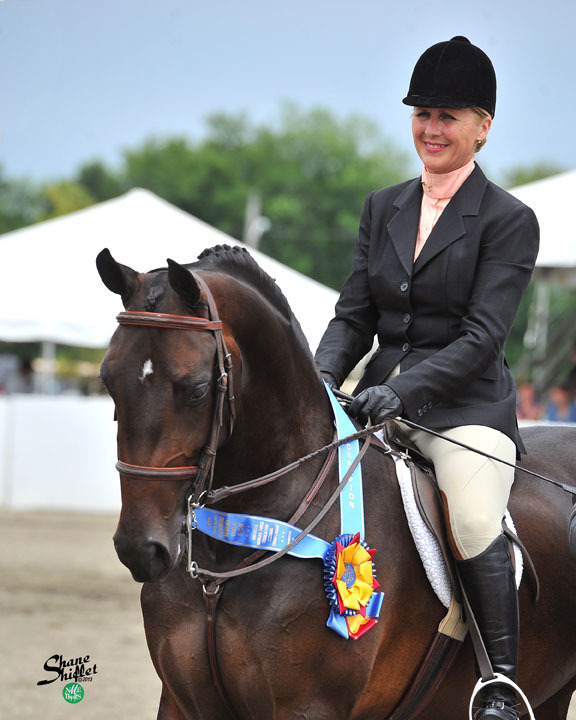 Lynn and LPS Out of Bounds were all about the show when they won the Open Park Saddle qualifier and then came back to take the East Coast Invitation Park Saddle Championship for Bill Haines of Ledyard Farm. 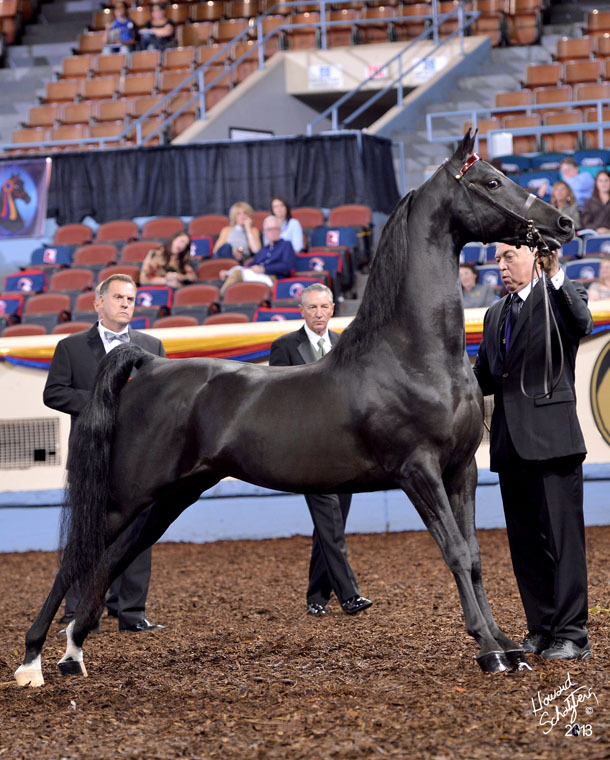 Man In Black made his first appearance of 2013 with Lynn in the saddle and came away with the blue ribbon in the Open English Pleasure. 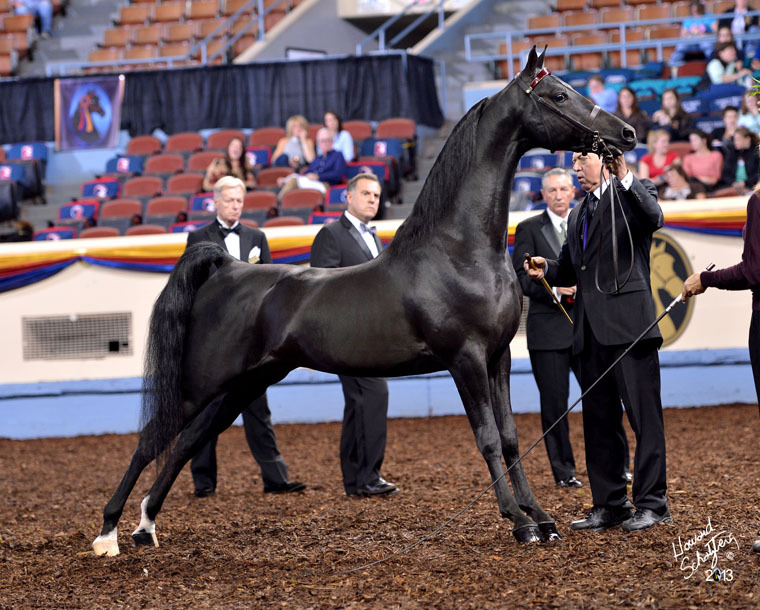 This exciting young stallion is also owned by Bill Haines of Ledyard Farm. 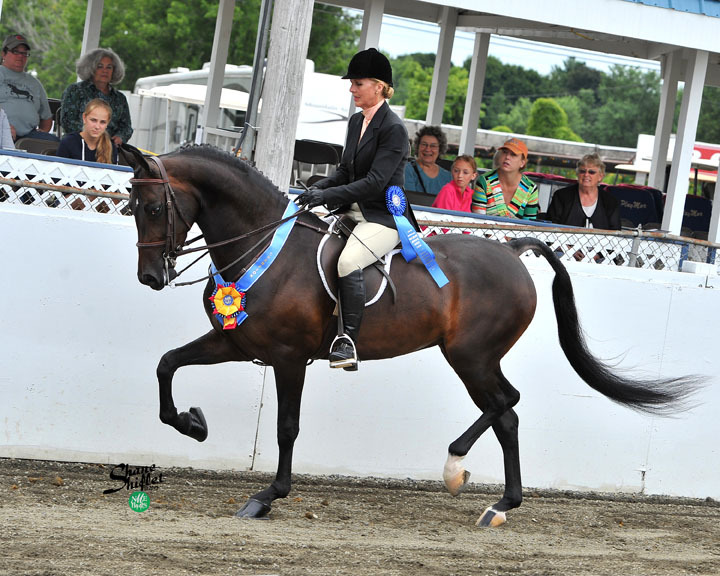 Nancy Flower and Portfolio, a two year old daughter of Town Assets, could not be denied the Two Year Old Pleasure Driving division at NEMHS, winning the qualifier and the championship in beautiful style for owner/breeder Lynn Peeples. 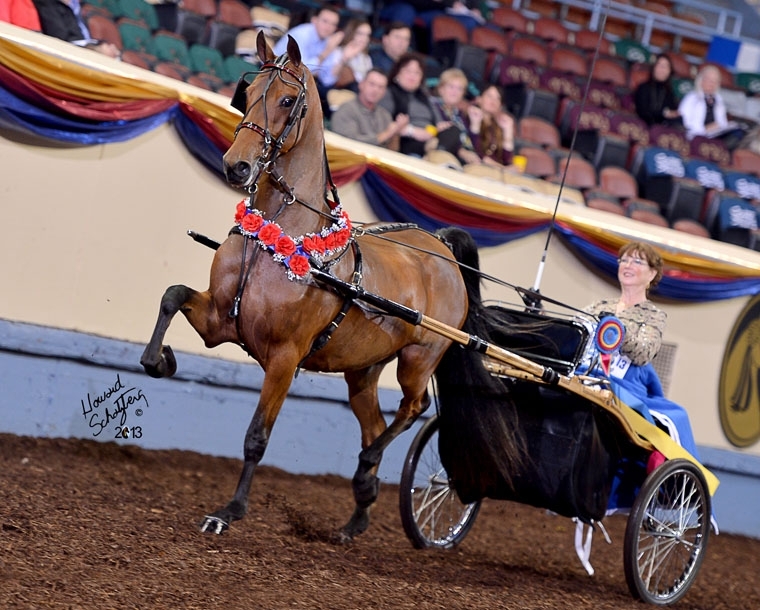 Still In Town proved he still had it when he secured his second Junior Champion Gelding title of the year, hot on the heels of his win at Penn-Ohio just two weeks earlier.